Summer vacation is over in my neck of the woods and school starts on Monday. Aside from preparing my classroom and school for all of our preschoolers and kindergartners, I am also preparing my son for his first day of preschool. He will be going with me to school this year and I am so excited! I can’t forget, however, that for my three-year-old, starting school is an unknown experience with some fears and worries associated with it. Many children fear a new school experience, but there are ways to help ease the transition for your young child. 1. Talk about your child’s school and use his/her teacher’s name as often as possible in the days and weeks leading up to the start of school. Young children like to know what is coming and need time to adjust to the thought of a new school, or even just a new classroom. Get a calendar and mark the first day of school. In the days leading up to the first day, mark off each day and count how many more days (or “sleeps”) before going to school. 2. Visit the school before the first day. Even if you can’t go inside, drive around and look at the building, the playground, etc. Talk about what will happen when you go to school on the first day. 3. Let your child help prepare for school. Pack his/her school bag together and let your child pick a comfort item to take to school in the bag. Sometimes just knowing that a favorite stuffed animal is inside is helpful in the transition. If your child will eat lunch at school, pack lunch together and include some favorite foods. A special note from Mom or Dad is a fun surprise to find at lunchtime too. 4. If your child struggles with saying “goodbye” at school, send a picture of your family to put up in your child’s cubby at school. When your child is feeling insecure, he/she can go get the picture. This is helpful at rest time too. Some children can relax and fall asleep more easily if they have a family picture close by. 5. 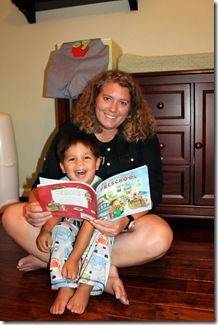 Read some books with your child about starting school. Talk to your child about how he/she feels about starting school. Make connections to the characters in the stories you read together. Some of my favorites are listed here.